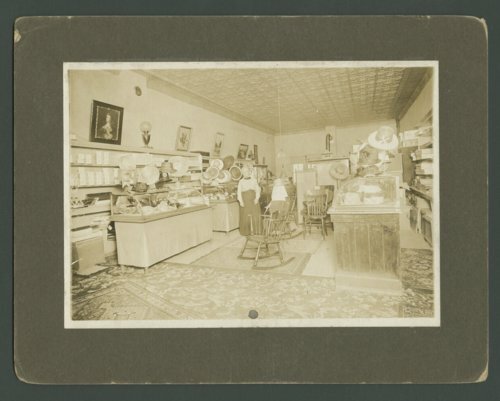 This photograph shows the interior view of King's millinery shop in Harper, Kansas. The owner of the business, Almeda Doorley King, is standing in the middle of the room surrounded by hats. The back of the image states that Almeda was born in Knox County, Ohio to the parents of Alvah Allen and Martha Cary and was the wife of George King. On September 15, 1925 she died in Osawatomie, Kansas.